No one likes to feel blue and most people don't like to see others feel blue either. When a friend, family member or co-worker seems down in the dumps, sick or just having a tough time in general, it's natural to want to say or do something to make them feel better or at least let them know you're hoping they see the light soon. Sometimes, coming up with the right words is difficult and even awkward. A small token or gift is often easier and can be very meaningful and brightening to the recipient who needed a sunny day. When the person to cheer up is in the hospital recovering from surgery or illness, or has just returned home, one of the best gifts available is a well thought out get well gift basket. Gift baskets have long been a classic choice for gift-giving for all occasions and situations. Gift baskets can be formal or silly, fun or serious. Some popular gift baskets over the years have included wine and cheese, chocolates, movie nights with DVDs and popcorn, candles, fruit, and packaged candy. Since a lot of get well gifts are given to people who are in or just out of the hospital, it might be best to choose something that is not immediately perishable as some food baskets tend to be. Get Well gift baskets come in many options for many occasions so choosing one is limited only to the imagination. When choosing a get well gift basket, consider the recipient of the gift as well as the occasion. A great option that is sure to please nearly anyone who needs to get well, is get well candy gift baskets. Get well candy gift baskets come in many shapes, sizes and varieties from expensive chocolates to bright and colorful lollipops or hard candies. A really unique and attention-getting gift basket idea is a retro candy get well gift basket. Retro candies are those candies that you remember having as a child, the ones that really stick out in your memory. They might be the favorite candy you always purchased at the corner store or the concessions at the little league games or the ones that the "cool parents" always handed out at Halloween. Some popular retro candy selections might be choices like Pop Rocks or candy cigarettes. While gift baskets have always been a go-to for holidays like Christmas or Mother's Day or occasions like job promotions or new babies, get well gift baskets are beautiful to look at and will bring a smile to the recipient's face even before they have a chance to dig in and get nostalgic about their treats. The best gifts to make anyone's day better are the ones that are unique, nicely packaged and have a bit of thought behind them. Birthdays are a fun and exciting time of the year where you get to celebrate growing up and passing by another year of life! Whether you're a child, adult or elder, birthdays should be celebrated every year. It's a chance for you or someone you know to feel special and appreciated, whether you purchase them something nice or simply spend the day with them. As we grow older, many begin to miss the importance of birthdays and forget the fun behind the day. But, no matter who you are, you should be able to celebrate your birthday and have a fun day. If you know someone who has a birthday coming up, there are many great gift ideas and little treats that will help you to show them you care on their birthday. Instead of purchasing a simple gift card, birthday gift baskets are even greater to receive and are both unique and personalized. When picking out birthday gift baskets, you can personalize it for your friend or family member to fit their age or personality. One great example are the retro candy gift baskets, perfect for adults who have a a sweet tooth or even kids who want to go pack to the past and eat some retro sweets. Retro candy is a different twist to ordinary candy and will have everyone loving it on their birthday. 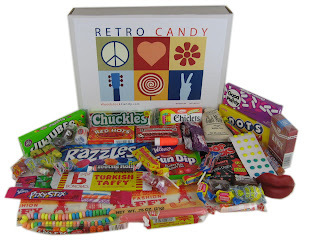 Retro candy gift baskets are also great for themed birthday parties, such as 80's or a fun roller skating party. It's easy to mix and match the gift with many others and luckily, everyone loves gift baskets. Along with the candy, you can also include other small gifts to create a big arrangement that is exciting to open! Retro candy is a fun way to spice up any birthday and is great for all genders and ages. Don't be afraid to have fun on your birthday! If you're looking for a perfect gift, birthday gift baskets are affordable and perfect for everyone. Customize the basket and make someone's birthday a unique and special one with a one of a kind present! With gift baskets, good friends and family, you can enjoy any birthday whether you're a child or adult. Make someone else's birthday special and don't forget to treat yourself great on your birthday - it's a chance to have fun and let go of stress and work. Plan your next fun birthday soon! Retro candy is fun. It does not matter if you were born in, 50's, 60's, and 70’s and beyond, there are retro candy gift baskets for you. If you are wondering what retro candy is, think about the candy that was being sold when you were a child. Some candy might also be called old fashioned or nostalgic candy. Whatever term is used, this type of candy will, more likely than not, be around for a log time. For individuals born in the 50s, 60s, 70s and beyond, they will probably see their children and grandchildren eating candy they used to eat. Some retro candy from the 50's might be Good & Plenty, Red Hots, Fun Dips, Bit-O-Honey, Lemonheads, Smarties and more. The best thing about these candies is they are still available today. One of the reasons these candies are still around is their demand. If there is a demand, especially from people who grew up in the 50', there will be a supply in every candy store. 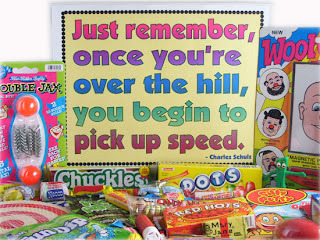 When it comes to birthdays or an everyday gift, the 50's retro candy gifts baskets will be sure to bring back memories. Walking down memory lane, in any era, will be attached to a child's most loved candy. Candy from the 60's might be Giant Taffy, Root beer Barrels, Tootsie Rolls, Mary Jane's, Pop Rocks, Pixy Sticks, Candy Lipstick and more. These candies and more are included in a nostalgic gift basket. Kids today who like the 1960's peace and love movement will be instantly transported back to the 1960's as they eat candy their parents or grandparents grew up eating. For individuals born in the 1970's there is nostalgic gift basket for them too. The candy included in this basket are Jujubes, Razzles, Necco Wafers, Chicklet's, Candy Necklaces, Candy Lipstick, Sugar Daddy's and a lot more. These candies were fun to eat, especially the candy necklaces and candy lipsticks for girls. A lot of children today want to have retro birthday parties and dress up in a particular era. 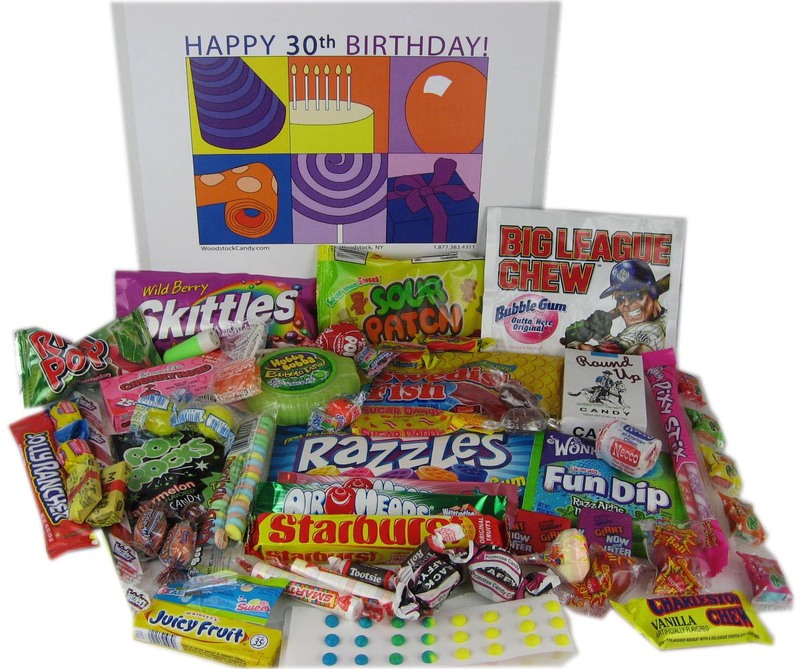 For parties like these there is no better way to celebrate than give retro candy gift baskets to the birthday girl, boy, young adult, older adults and even birthday party guests. In fact, this would be a great party favor. Kids love candy and usually expect it at a birthday party. When children come home from a birthday party with one of these gift baskets, they will probably take their parents back to the decade the gift basket was designed for. Parents are certain to want some of that candy they grew up eating too. Birthday's are all about fun, fun, fun and one way to put a smile on someone's face is to surprise them with an old fashioned basket of candies they loved. Of course the price of candy has gone up throughout the decades. This is to be expected with inflation. Nevertheless, old fashioned candies remain in candy stores and please children and adults from whatever era they were born in. Retro candy boxes are a fantastic gift wrapping option that add a unique touch by which guests can remember a special evening. Dive into the past by providing a complete effect of retro décor. These vintage boxes and retro candy gift baskets can be filled with retro candy reminiscent of simpler times and the classic candy shop memories grandparents tell their grandkids about. A retro-inspired party makes a great option for birthday parties for people of any age, as well as fun anniversary themes or any occasion to throw on their best vintage thrift shop threads. Small party favors like old-fashioned candy and decade boxes are a great token for guests to take home the spirit of the party with them. Some retro candy boxes include those that resemble classic vintage items associated with the 50s era, for example. Take the Classic Convertible candy box. This line of candy boxes include tiny cardboard recreations of the 1955 and ‘56 Chevy Bel Air, the 1955 Ford Fairlane Sunliner, the pink 1956 Ford Thunderbird, the red 1964 Ford Mustang, the yellow 1964 Ford Mustang, the 1957 Chevy Hot Rod, the 1958 Chevy Corvette, and the 1957 Chevy Hotrod. Each mini retro convertible replica is outfitted to hold a small bag of candy, preferably the guest of honor’s favorite kind. With authentic, colorful artistic details, and measuring just under a foot, this particular kind of retro candy box makes quite the impression while capturing the sentiments of a vintage era. Retro candy gift baskets can be filled with retro candy for the most complete effect at parties where guests dive into the past. Some kinds of candy might take one back to when they were kids or it may even take their parents back to when they were kids. Next to smell, taste is one of the senses most closely related with memories. What a unique way to complete a “dive into the past” party theme. A tasty reminder is a delicious way for party guests to relive their childhoods and enjoy good memories from earlier in life. Spurred memories from yesteryear can also be a great way to add to the spirit of the party. The tasty treats will no doubt stimulate interesting conversations or humorous stories. It is possible to find candy from several eras on the Internet to accommodate the decade being celebrated. A hostess might fill her vintage candy boxes with retro goodies that might include jaw breakers, Bazooka bubble gum, Claey’s Old-Fashioned hard candy, Chuckles from the ‘50s, Moon Pies from the ‘60s, and Nintendo Power Mints from the ‘80s. Candy from different eras can even be used in games where guests guess the correct decade for each kind. Besides fond memories, the party favor is the only thing guests carry away from a party. So it’s important that this part of the evening be as memorable as the rest. In a party where guests have enjoyed an evening of diving into the past, retro candy boxes are a fun and unforgettable way to carry this off.